frob had the most liked content! Like asking me to choose my favorite child. The "pin" is called a ferrule. That image looks like the ferrule was pushed into the spar. Getting them out can be tricky, since both ends of the center spar have ferrules in them. On many other kite styles, a spar with a single end ferrule you can push it out from the other side, but the Hadzicki wing style's center spar is tricky because both sides have ferrules. You might glue something to the end of the ferrule, then when the bond is solid, pull the ferrule out. I'm sure there are other ways to extract them from people with more experience than me. They can be superglued back in place once extracted. Or they can be pushed into the spar, forever trapped inside as you glue a new ferrule over the end. In strong wind or in turbulent wind it can be necessary to add an extremely long tail to a kite, in weaker wind a shorter tail tail or even no tail may be best. Tails add weight and therefore stability. The weight changes the balance, which also modifies stability. Kites that twist and turn in turbulence will do it less with a tail because the heavy tail effectively says "this direction is down." The longer the tail the more weight it has that keeps the kite pointed the right direction. Kites that are jittery or dart around will move more slowly with a tail because there is more mass and more drag. The heavier the tail, the slower the kite will move. But kites that are struggling to stay in the air with insufficient winds should drop their tail, because the tail adds weight and drag. 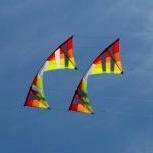 As a result there is no simple math of how big a tail should be for all kites. It should be long enough to add stability, not so long that it drags the kite down, and that all depends on the conditions at the time. "Worth it" is always relative to the person and their circumstances. For some people it is, and other people it is not. People build the kites, both from existing plans and from their own designs. 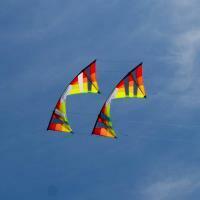 People make all kinds of wild and wacky designs and show them off at kite shows and other events. Sometimes they fly well, sometimes they are best as decorations. If you have interest in doing it, and have the time and money for it, then go for it. There are many web sites with kite plans that range from simple to advanced skill requirements. I personally wouldn't start out with an 8 meter project, but if you're comfortable with sewing large objects already then it might be an okay place to start. That's a lot of fabric to work with, especially if you've never built a kite before. You might instead start by making smaller (and simpler) sleds and foils to gain some experience. They would be easier to learn how to sew the kites and how to rig the bridles. I'm in Austin. I've made the trek out to Galveston's beaches (just beyond Houston) a few times, as well as out to the fledgling Texas City kite festival. The drive to Houston is long, but if it were a Saturday for a day of group flying with others, it would be worthwhile for me. Lightning is the exception to that. If there is lightning in the forecast, no flying. It can be fatal. But snow or rain, with proper gear those can be fun. That's exciting. Given how you've listed South Padre Island as your location, I'm sure you'll have plenty of great flying days on the beaches. I'm partial to #2. I already had a bunch of of kites in similar sunburst colors, so the "hot fade" Djinn was my automatic choice when picking those up. That yellow to red burst looks good, although I'd probably swap out the green in the middle with white instead. My second choice would be #4, it looks like a plaid or woven color pattern, even though it might not stand out against the sky very well they're soothing to me. #1 or #5 only if you're looking for something to fly in July. @gmrviper Two were just posted to Facebook. I'm sending a direct message with the link. No snow in central Texas, but about a foot in the city I grew up. I don't miss the snow. However, the arctic blast hitting the country has dropped our temperature down to about 45' F with wind chill hitting the upper 30's and some light rain, so layers with a light jacket is certainly in order. I've had two flying days this week, and look forward to another tomorrow. As nice as winter is for flying here right now, summer is the worst. Typically it means no flying outdoors for about two months of summer due to heat advisories. In summer months I see all the videos and think I should abandon my job for a road trip. That's a LONG drive to try out the kites. Even so ... Potentially well worth it, although closer events will be easier on the pocket book. Even if you've got your inexpensive beginner kite, a day working with some experienced or professional folks will simplify the discovery. You can still learn on your own. People do it. I first learned to fly dual line as a kid in a field by myself in the pre-Internet era, with some old kite magazine descriptions and the dream that maybe someday I would see a kite festival. Decades later I learned to fly quad line watching hours and hours of videos and asking questions. It is possible. Even though you can probably do it alone, it is so much easier having someone who can observe and give corrections instantly, or who can demonstrate as you repeat and copy the motions.